Susan Shie is a full-time artist who paints, draws, writes, and sews in order to create her artwork. 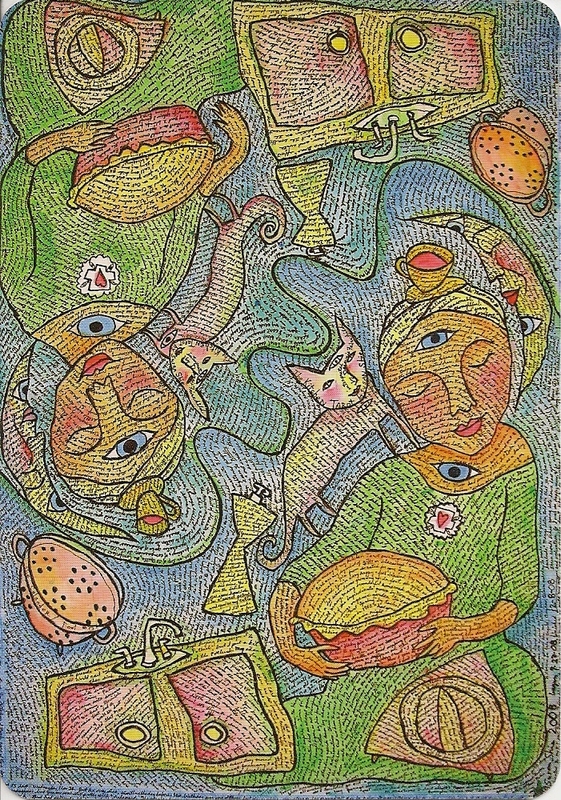 Susan Shie began in 1998 with the Colander piece for the traditional Fool card. Each new mixed-media art quilt had its own size and proportions, and during the first year, she made only two pieces because her painting and hand sewing were so time-consuming. Later she learned to use both airbrush and airpen, and slowly switched from intense hand sewing to hand journaling and machine sewing. These changes allowed her to work faster. Dennis Fairchild is a well known author of more than a dozen books and prediction calendars. The cards are larger than in traditional decks and follow RWS tradition only so far that Justice is 11 and Strenght is 8, but the artist has changed completely the names of the arcana in order to fill the kitchen, e.g. instead of The Tower, we have The Pressure Cooker or instead of The Moon, we have The Calendar.The art shows many words as a sort of quick reference to the traditional name and meaning of the card.